One of the most effective and complete multivitamin and mineral options on the market. A daily dose of the A.M./P.M. 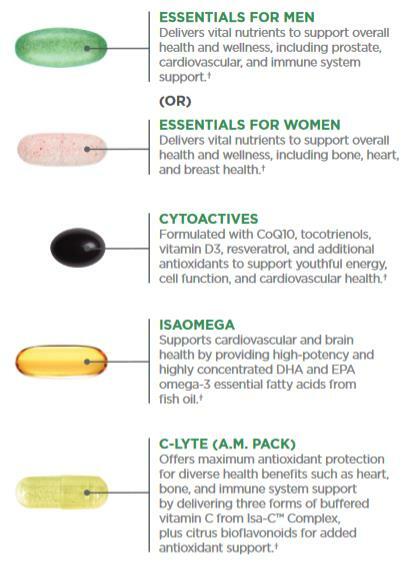 packets helps protect you from the effects of aging while providing the best in total-body support. Available in both men’s and women’s packs. For more information, download the Complete Essentials Product Information Guide here. 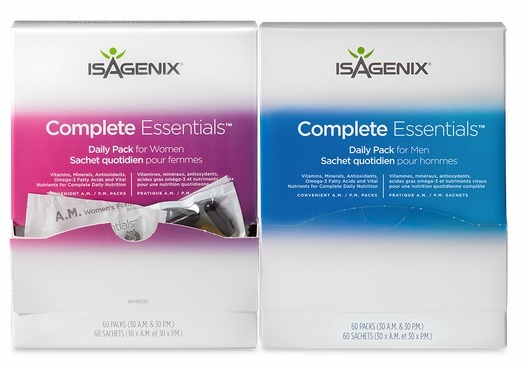 How Do I Buy the Isagenix Complete Essentials Daily Pack in Canada? RECOMMENDED: Sign up and Save (CA$77) — Sign up to the Isagenix autoship program to become eligible to have access to the cheapest wholesale prices. At the end of the checkout process you’ll be asked to set up your next month’s order. Autoship can be cancelled at any time, even after you take advantage of the cheaper prices on your first order! There are no locked in contracts of any sort. Full Retail (CA$102.67) — If you prefer not to sign up and take advantage of the lower pricing, you can purchase the products at full retail price. This is not recommended as you can cancel autoship at any time. Your first order with IsaAxcess is covered by a product money back guarantee within 30 days. If you’re not completely satisfied with your Isagenix Daily Complete Essentials Pack, send it back to Isagenix Canada for a refund!